Auto post content from Feeds. plugin can check your specified feeds regularly & post every new feed item as a new post.Fetch full content from summary feeds. 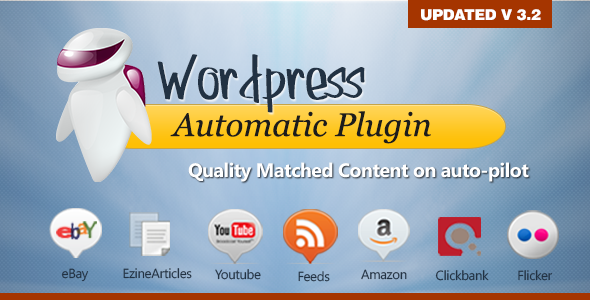 Wordpress automatic can convert truncated feeds to full content posts with a big success ratio . Extract specific parts of original feeds posts. Wordpress automatic can extract two specified parts of the original post by CSS id/class, XPath or REGEX and concat them to post to your wordpress. Extract Categories. The plugin can set the created post categories to the same categories for the original posts. Extract original tags. Wordpress automatic can extract tags from the original post using CSS id/class and set as tags at the created post. Extract original author. Wordpress automatic can extract author name from the original post and assign as at the created post as the author if exists or will create it, if not exists. Skip posts with no content. The plugin can verify the extracted content and skip posts if it has not content. Skip non-English posts. Wordpress automatic has the option to set the post status as pending,if it suspects that it is not written in English. Skip posts without images . The plugin have the option to check the extracted content and skip if it does not contain images. Post oldest items first. Wordpress automatic has the option to post older items first, By default it posts newest items first. Decode html entities. Wordpress automatic has the option to decode html entities of the extracted content/title. Convert encoding before posting. The plugin has the option to convert extracted content encoding from any specific encoding to utf-8 to be compatible with wordpress. Duplicate title skip. The plugin can verify that there is no previous posted post with the same title. Featured image from Facebook og: image tag. The plugin can extract the image used for facebook as a thumbnail to set as a featured image .